After a lengthy Las Vegas Summer League, the dust has finally settled and the tournament came to a merciful conclusion with the Portland Trailblazers knocking off the Los Angeles Lakers in a very entertaining game. For the Denver Nuggets, they had second-round pick Thomas Welsh play, two ‘draft and stash’ players in Vlatko Cancar and Petr Cornelie join the roster in Las Vegas, and also had returning players on the current Nuggets roster play as well, such as Tyler Lydon, Monte Morris and Malik Beasley. Now that the 2018 summer league is in the books, here are the good, bad and ugly covering all things from Denver’s time in Las Vegas. Morris headed into summer league with plenty to prove and the possibility of winning the Nuggets backup point guard role for the upcoming year. Unfortunately, Morris was not able to lock in being the backup point guard for this upcoming season, but it had nothing to do with the spectacular play was seen from Morris in Sin City. Prior to summer league, Morris said that the most important thing for him was to show how he can run a team as a leader on and off the floor as well as shoot the ball with consistency. When you take all of those expectations into account, Morris proved that he’s capable and had a successful campaign in summer league. Through four games he averaged 17.5 points, 6.3 assists and 3.3 rebounds per game and led the team to a 3-0 record before the summer league playoff tournament began. In that same time, Morris had just five turnovers while dishing out 25 assists which only brings light to the NCAA-record assist-to-turnover radio he currently holds. Morris attacked the basket, showcased his newly reconfigured jump shot and set up his teammates for easy baskets throughout each game he played. With the signing of Isaiah Thomas, it appeared as if Morris was headed to another year of being on a two-way contract, but on Thursday, Denver converted Morris’ two-way contract into a three-year NBA deal worth $4.8 million slotting him into the 15th and final guaranteed roster spot. The last year of the deal is non-guaranteed, but that is a big show of faith by the Nuggets front office. It appears that the extended work that Morris has shown since being drafted coupled with his stint in the G-league as well as his play in summer league secured him a spot as the third point guard on the Nuggets roster. He showed that the team can trust him to step in and fill a role when needed and that he is a part of the future. Now that Thomas has signed on to be the Nuggets backup point guard and Morris was converted to a full NBA contact, there is now an open two-way contract for the Nuggets. Players like Emmanuel Terry from Lincoln Memorial University, Kenrich Williams of Texas Christian University, and also standout surprise DaVaughn Akoon-Purcell — who played overseas in Denmark a year ago — all placed their bid in for having a crack at that two-way spot with somewhat strong showings. Terry led the team in field-goal percentage as he finished shooting 61 percent from the field and being aggressive on both ends of the floor. Williams was a perfect role player as he finished seond on the team in rebounding at 5.6 rebounds per game and led the team in blocks. Although Williams didn’t score as much as anticipated, he does all of the little things right and is a player that a coach could place on the floor and the team would not skip a beat on either end of the floor. Cancar was truly a fan favorite as he shot the ball well, ran the floor better than expected, and showed he could eventually play at the a NBA level, but he still has one year remaining for his contract in the Adriatic league. 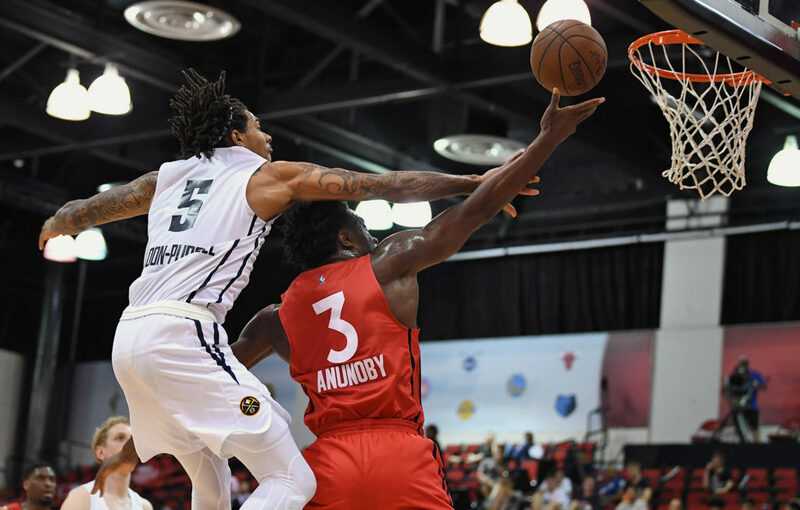 Akoon-Purcell was the third leading scorer on the team behing Beasley and Morris at 12.0 points a game and showed that he can get hot and hit shots from anywhere on the floor. On Thursday, Denver signed Welsh to a two-way contract and Morris was converted to a guaranteed NBA contract, leaving the other two-way contract slot open. The difficult part is now choosing who Denver should offer the final two-way contract to. Each of Williams Terry, and Akoon-Purcell showcased different areas of expertise in which Denver could benefit from, but none of them were a clear-cut favorite for Denver to take on. The Nuggets finished Las Vegas Summer League with a 3-2 record after beginning with a 3-0 record before being ousted by a Toronto Raptors unit that had yet to win a game. It was OG Anunoby that led Toronto to victory over Denver. He finished with 22 points as he went from 9-17 from the field and displayed his tenacity on the defensive end that left fans dazzled. Denver also allowed Middle Tennessee combo guard Giddy Potts go for 14 points off the bench including going 4-7 from beyond the arc. There were glimpses of great things from all of the Nuggets summer league standouts. Beasley had multiple steals in the open court that led to easy highlighgt dunks surprise stand-out performances from fan favorite Cancar, and also a few games from Akoon-Purcell who arguably was Denver’s third best player, but they fell yet again even though they were favored as the fourth overall seed in the tournament. Of course, Denver would have wanted to win more and play longer in the annual summer tournament, but this trip was far more productive than the record suggests as it answered a few questions the organization wanted to know heading into the 2018-19 season.